Hero was developed from a concept created for a magazine article. We were asked to design a yacht to complement an owner’s watch. The owner we were designated wore a Rolex Submariner. With these parameters in mind we started thinking about an appropriate vessel to complement this iconic timepiece. 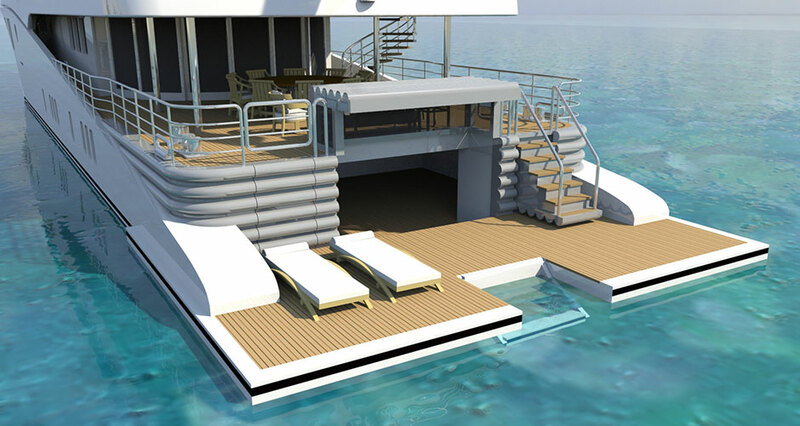 A luxury yacht that was classic in design but discreet and supremely functional. We decided on a family boat, large enough to house a luxurious interior, but solid and robust so that its inhabitants benefited from the security of a thoroughly sea worthy vessel with world cruising capabilities whatever the conditions. So four cabins, an owners suite, a couple of aft lounges/saloons and a large aftpeak room/ beach club. We also wanted a generous swim platform to provide easy access to the sea via a set of drop down steps, whilst not compromising on the beach area.